Helm/Armor/Gauntlets/Leggings-Apparel of Leeroy, Paladin of the Catacombs. Long ago, the Way of White produced its first Undead, a paladin in golden armor. With the legendary treasures Grant and Sanctus, Leeroy set out Lordran, Land of the Gods, in the first Undead mission of the Way of White. Location: Tomb of Giants. You must have killed Leeroy the Paladin's phantom on your way to Nito's lair. After you have done this, defeat Nito, and you will find a corpse where you dropped down to fight the boss containing this armor. Notes: You must be in human form for Leeroy's Phantom to invade your realm and must be done before you defeat Nito.it is possible to get this set without defeating Nito. You can enter Nito's lair by sitting in the coffin in the Catacombs after killing Leeroy but before you face Nito. You will still find the set here. You do NOT have to defeat Nito to obtain this armor set. 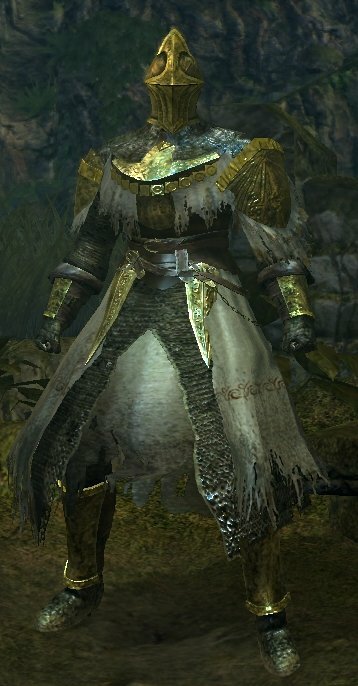 Another way is after defeating Paladin Leeroy, simply go as if you were to join the Gravelord Covenant by nestling in the coffin in the catacombs. Nito will bring you to the Tomb of Giants and you can obtain the armor set there. You do not need to join the Gravelord Covenant. A way to obtain the armor without killing Nito is by going to Nito the same way as a Gravelord Servants. After defeating Leeroy the armor will be in Nito's room.